Shopping for a new Kia Forte? The base 2019 Kia Forte FE has low rolling resistance tires that help it earn better fuel economy than other trims. The 2019 Kia Forte pairs stylish good looks with a lot of features, making it a compact sedan standout. 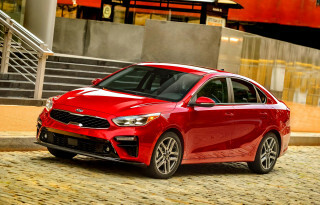 The 2019 Kia Forte compact sedan boasts scaled-down Stinger looks, but they’re not backed up by sporty car performance. The 2019 Forte’s fresh design sits over a 147-horsepower, 2.0-liter inline-4 paired in most versions to a CVT, although a 6-speed manual is standard on the base model. 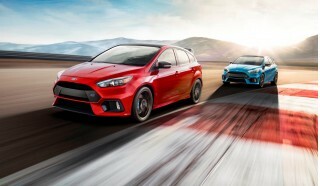 Hatchback and more powerful versions don’t return for 2019, although we wouldn’t rule them out indefinitely. The latest Kia Forte—in FE, LXS, S, and EX trims—is a lot of compact car for the money. All Fortes boast class-up standard features such as an 8.0-inch touchscreen for infotainment with Apple CarPlay and Android Auto compatibility, active safety tech, and 6-way adjustable front seats. In our initial testing, we found a soft, compliant ride paired to steering that’s more direct than we’ve come to expect from lower-cost cars. The Forte’s power is adequate and the engine mates well to the CVT. We’re looking forward to more time behind the wheel, though, to bolster this review. Inside, the 2019 Forte has above average space for a compact car—6-footers can sit behind 6-footers. Base Forte FEs can feel low-buck, but the other trim levels have soft-touch plastic trim throughout. The Forte comes standard with automatic emergency braking and active lane control. Adaptive cruise control, blind-spot monitors, and automatic high-beam headlights are optional. The 2019 Kia Forte balances classic proportions with upmarket detailing. Ever since former Audi designer Peter Schreyer took over Kia styling in 2006, the brand has been a consistent design leader. 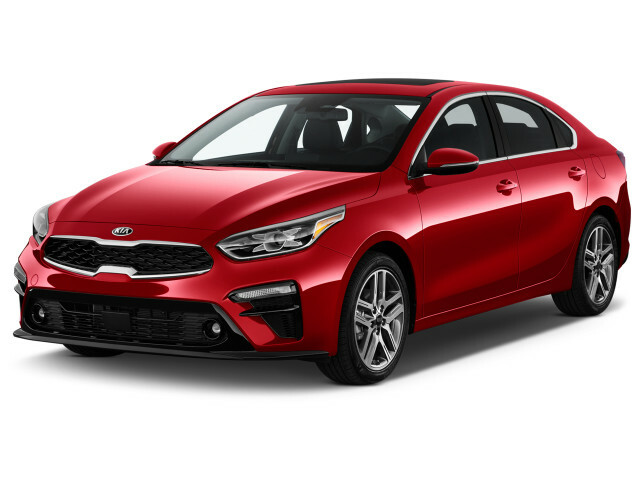 The 2019 Kia Forte draws heavily from its Stinger full-size sedan brother, with crisp, contemporary sheet metal that belies its front-wheel-drive platform. Kia sought to echo the design cues of the Stinger full-size sedan, at least as much as is possible when the Forte is constrained by the realities of front-wheel drive. To achieve that, the Forte’s designers pushed the base of the windshield back 5 inches compared to the outgoing model and shortened the trunk lid correspondingly, cultivating that sought after long-hood, short-deck look that is shorthand for sporty performance. It excels in its details, too. Only the base Forte FE rolls on 15-inch steel wheels with plastic hubcaps. The 16- and 17-inch alloy wheels on other trims look great and complement its style. Inside, the Forte’s dash is dominated by its big-for-the-class 8.0-inch touchscreen for infotainment. Perched high with some secondary buttons and knobs below, it straddles the line between afterthought and well-integrated. Nice touches for the class such as stylish round air vents, matte silver finish on some trim levels, and well-grained surfaces add to the upscale look. The 2019 Kia Forte’s performance doesn’t match its looks. Some cars look faster than they are. For example: The 2019 Kia Forte. Last year’s model was available with more power, but for now there’s just one choice. The Forte uses a 2.0-liter inline-4 rated at 147 horsepower and 132 pound-feet of torque. Curiously, Kia eschews direct fuel injection for the more established port injection. 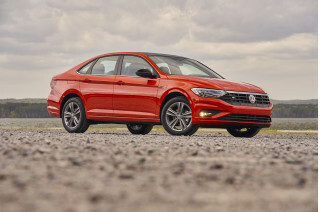 The inline-4 is tasked with moving about 2,800 pounds of compact sedan, but the upside is fuel economy that touches as high as an EPA-rated 40 mpg highway. A 6-speed manual transmission comes standard on the base Forte FE. A CVT is optional on the FE and standard otherwise. The CVT is Kia’s first, but the design is increasingly common in compact cars. The knock against CVTs has been that in their search for the optimum gear ratio they can leave the driver feeling like the engine is revving excessively. And to ears accustomed to hearing distinct changes in engine pitch on upshifts, the CVT’s slurring of ratios can sound disconcerting. So Kia’s CVT is programmed to move among pre-selected ratios, simulating the sound and feel of an automatic transmission. And when the shift lever is moved to the left, engaging sport mode, the driver can shift up and down among these simulated gears. In our initial preview drives, this worked surprisingly well although the shifter’s push-forward-to-upshift, pull-back to downshift is opposite the way it should be. Regardless, Kia’s continued use of a shifter that slides through discrete positions for Park, Reverse, Neutral and Drive is commendable in an age when needlessly unfamiliar and complex shifters are inexplicably gaining favor with other manufacturers. Kudos to Kia for preserving a simple, clear shifter design. The Forte rides softly, especially with the smaller 15- and 16-inch wheels on FE and LXS trims. Higher-trim Fortes have acoustic glass that quells the outside world better. The Forte is tuned with firmer steering that provides more feedback to the driver than the previous car’s over-boosted steering that could feel video-game synthetic. The 2019 Kia Forte is spacious for a compact sedan, but base models can feel a little spartan. The 2019 Forte’s front seats are all-day comfortable thanks to progressive seat foam that tries to counter fatigue. Both front seats are height-adjustable, a rarity among compact sedans. The Forte EX includes 10-way power adjustment for the driver’s seat, but other trims have 6-way manual controls. Dual-zone automatic climate control is standard equipment on even the base Forte FE, so forget about those days of sweating in an econobox with manual roll-down windows during the dog days of summer. Even the most affordable Forte will keep both the driver and front seat passenger at the temperature of their own choosing. The 2019 Forte is 3.2 inches longer than the outgoing model and is 0.8 inches wider, at 70.9 inches. This added space contributes to a cabin that lets a 6-foot passenger comfortably sit behind a 6-foot driver with a couple inches of knee and head room to spare. In some competitors, that same passenger also fits, but is snugly ensconced with no space to move around. Touches like thicker side glass and noise insulation on the transmission contribute to a placid cabin that is 5 decibels quieter than last year’s model. Even cargo has decent stretch-out space. A 15.3 cubic-foot trunk on all Fortes is above average for a compact sedan. The 2019 Kia Forte comes well-stocked with active safety tech, but it hasn’t been crash-tested. The 2019 Forte earns a Top Safety Pick+ award from the IIHS, but the feds haven't rated one yet. The good news for now is that the 2019 Forte will get an extra point for its standard automatic emergency braking and active lane control. Higher-trim Forte sedans offer automatic high-beam LED headlights, adaptive cruise control, and blind-spot monitors, too. 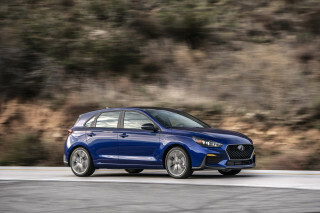 For a compact sedan priced under $20,000 to start, the 2019 Kia Forte surprises with its high feature count. The base Forte FE costs $18,585, including a mandatory destination charge. 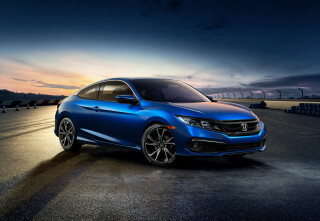 For that money, buyers get power windows and locks, dual-zone automatic climate control, cruise control, 15-inch wheels with hubcaps, and an 8.0-inch touchscreen for infotainment with Apple CarPlay and Android Auto compatibility. Kudos to Kia for continuing with simple, easy-to-use controls for its system, with the conventional rotary volume knob on the left and tuning knob on the right, with clear, obvious touchscreen functions on the display. The Forte LXS adds 16-inch alloy wheels, a few exterior appearance tweaks, a split-folding rear seat (instead of a single-piece folding unit), and upgraded interior trim for less than $20,000. That puts it about $500 well-spent dollars more than a Forte FE with the automatic. We'd probably be fine with the LXS rather than upgrading to the Forte S for about $1,100 more. It adds a rear-seat armrest, leather-wrapped steering wheel, satellite radio, and the option to spend $1,200 more on a power moonroof, and LED headlights with automatic high-beams. Our money would either be on the base FE, the LXS with the CVT, or the range-topping Forte EX that costs about $23,000. For that money, buyers get heated and cooled front seats covered in synthetic leather, a power driver's seat, keyless ignition, and a host of small convenience upgrades such as LED turn signals integrated into the side mirrors, a glove box light, and a pair of USB ports. 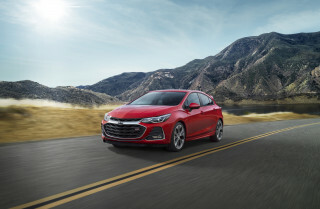 What's missing is a zippier Forte, something Hyundai offers in its Elantra GT. Kia might be the style and efficiency leader, but Hyundai is ready for more fun. The 2019 Kia Forte is among the least thirsty compact sedans. The new CVT fitted to the 2019 Kia Forte helps its small engine sip fuel. The thriftiest Forte is the base FE trim with the CVT, which is rated by the EPA at 31 mpg city, 41 highway, 35 combined. The CVT is standard in other trims, as are larger wheels that dent those figures to a still-solid 30/40/34 mpg. The base 6-speed manual transmission available only on the Forte FE saves buyers about $1,000, but will cost more at the pump. It’s estimated by the EPA at 27/37/31 mpg. Looking for a different year of the Kia Forte?